Sometimes it can be overwhelming to think about how to incorporate faith into our already busy home practices, especially in the summer when all our routines are thrown off and the schedule changes almost daily. But never fear. There is hope! And believe it or not, there is a tool that everyone can use, quietly embedded into our Sunday morning worship practices. 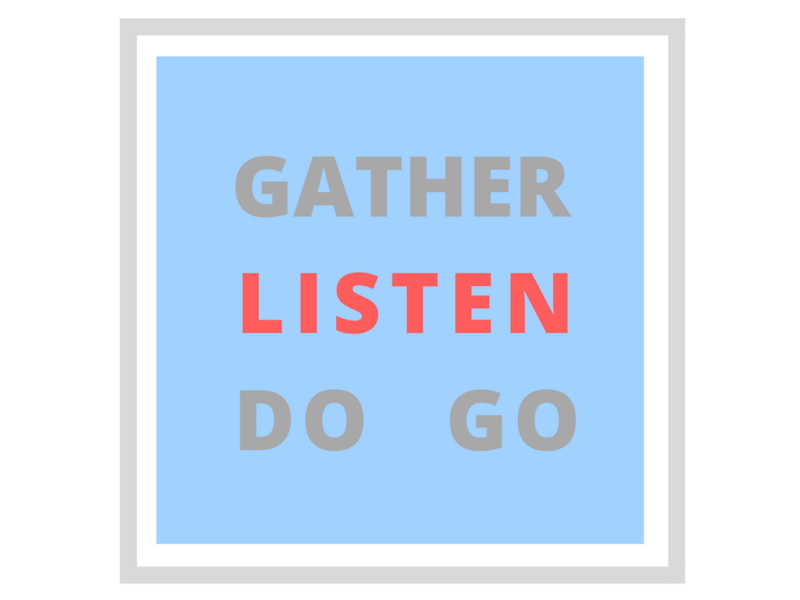 This tool is called the Gather Listen Do Go pattern. On Sunday mornings we begin by Gathering Together in One Accord when we sing and pray at the opening of the service. Next we Listen to what the Spirit is Saying through scripture readings, sermons, and stories. Then we respond to what we have heard, by Doing All Things as Unto Christ, including reciting the Creeds, praying for the needs of the world and our community, confessing what we have done and left undone, and coming around the table to participate in the breaking of the bread together. And finally, propelled by the good news and love of Christ we Go Into the World to Love and Serve the Lord. A way to GATHER together through prayer or song. A way to LISTEN to others through storytelling (podcast, movies, videos). A way to DO something in response to the storytelling through crafts, activities, and games. A way to GO into the world to love and serve through service project ideas. You can make this pattern fit your own family’s life. You don’t have to do everything all at once – Gather, Listen, Do and Go can fit into the life you already share. For example, you could Gather your family for dinner with this short printable prayer. You could Listen through a podcast. Here’s a good one for adults on growing as a parent, and here’s the iTunes link for Forward Day by Day, good for middle school and above. 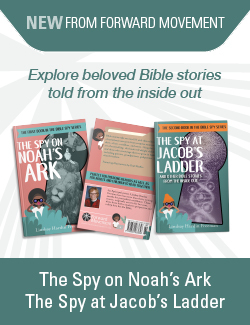 Listen through the list of scriptures for the day and get a short meditation and question for discussion – great for car rides. 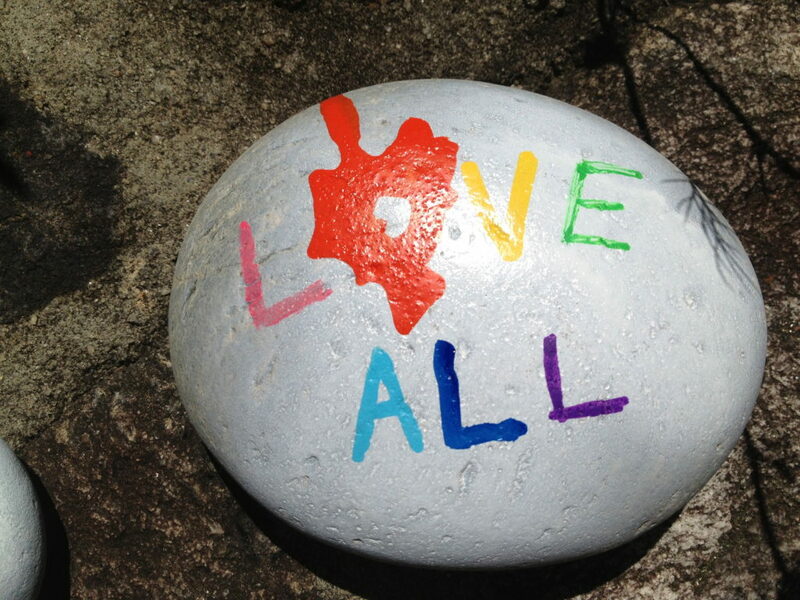 If you have rocks, paint, and some free time, you’ll be all set to Do right at home. And there are many ways to Go by serving with a local animal rescue organization, food ministry, or caring for extended family or friends. Our church sends out a newsletter called weFaith to families with ideas for the pattern, but the principles can be used by any family. All you need is a little intentionality and some quick Pinterest searching, and you will be pleasantly surprised to find out just how easy it is to take your family’s faith experience from something you “do” on Sundays, to something you live all week –and all summer – long. Just remember to look for the following opportunities and you will be golden! A way to Gather together in prayer or song or gratefulness. A way to Listen to something that sparks conversations. A way to Do something together in response to that conversation in the spirit of Christ’s love. A way you can Go into the world, leaving it a little better than you found it. How might you gather, listen, do and go this summer? Thanks Jerusalem! How do we sign up for the weFaith newsletter?